I have made my son's costumes every year since he was 2 years old. My son is now 9 years old. We are both big Star Wars fans! He was Han Solo a couple of years ago and we wanted to do another Star Wars theme this year. 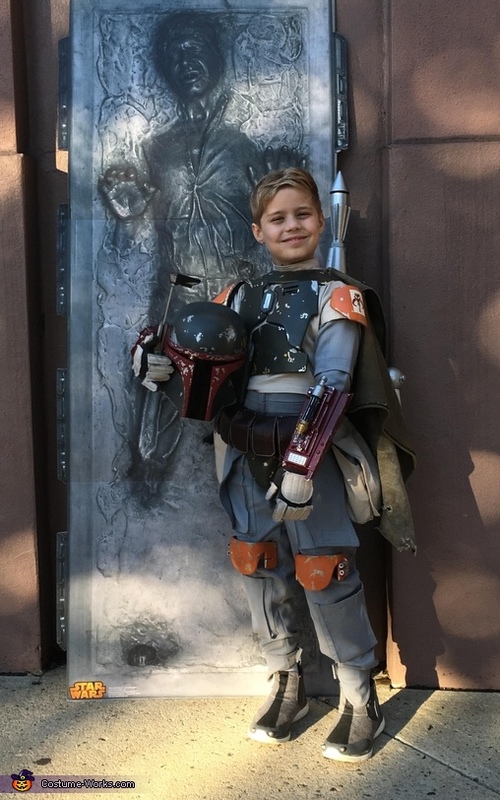 My son Ethan picked out Boba Fett and I started making this costume in June 2017 to be unveiled this Halloween season (2017). Last year he was a Ghostbuster and I enjoyed making his proton pack. Therefore, Boba Fett seemed like a good challenge this year especially with making his jetpack look authentic and from scratch . This was a extensive and time consuming costume this year as I was compelled to make sure all the details of the entire costume were spot on. I do not get a chance to tap into my creative side as often as I would like due to me job as a restaurant manager. I feel making a costume and my son seeing it being made step by step is a great bonding experience. He loves to show off the costumes every year and he beams with pride when he shares that his dad makes it. As a Star Wars fan since youth, I have been attracted to the artistry of the Star Wars characters. Boba Fett is an underrated character in my opinion but as you can see, has an amazing and intricate costume. I chose the Boba Fett costume from Return of the Jedi because there were more colors in his armor and jet pack. I watched the movie as well as hours of internet searches to study the costume, I watched clips over and over again to see how Boba Fett moves in his costume. My son would inspect each piece and critique it to make sure I did not miss a dent or scratch on the costume. We wanted to make the most authentic looking Boba Fett costume ever (besides the actual one in the movie). I am proud of the final product and feel it is my best creation yet. I hope you find it extraordinary too! I used many different products and tools to make Boba Fett. For the jet pack , I used Sintra pvc board, , mouth wash caps, superglue and spray paint. I used liquid mask for weathering on all pieces including the helmet and gauntlets. For the helmet and gauntlets, I used Smooth Cast 65D and a silicone mold maker. I welded the visor and used spray paint. For the armor, I also used Sintra pvc board. The shoes were modified with fabric paint and clothing studs for spikes. I also used a lot of clay to mold parts. I harvested parts for the back plate and codpiece from a 48 inch storm trooper, modifying both parts extensively. I made Nylon straps and used Velcro. I used a Disney Parks toy for the blaster, modified with extra red lights. I purchased a voice changer online. I custom sewed the jump suit, flak jacket, ammo belt , pouches and made the rope belt. I molded the helmet and gauntlets so the size ratio would be appropriate for a 9 year old. I did not buy a helmet to modify because I did not want a bobble head. The ears on the helmet were the only thing not crafted by myself however it was modified to use a metal stalk as a range finder. When creating this costume I started with the gauntlets, then constructed the jet pack with multiple paint layers. Thirdly, I modified the back plate and armored collar and mounting system to make the jet pack removable. I then then sculpted and molded the helmet. The helmet also has multiple paint layers. After that I modified the gun and designed and created the soft fabric parts. We had several opportunities to show off Boba Fett this year. My son first wore it at his Cub Scout Halloween Party where every kid came up to him to touch the costume. They asked it they can wear the helmet and were impressed that Ethan felt comfortable wearing so much gear. The parents are use to Ethan having a extravagant costume and stated that they have never saw a costume with so much detail. Everyone tells me that I am in the wrong field. Parents said that it is was a perfect replica of Boba Fett! We also visited the Sleep Hollow/ Tarrytown , New York parade. People stopped Ethan on the street to compliment the costume and several people asked to take a picture with Ethan. The best reaction was a man running out of restaurant after us wanting to tell us that he never saw such an amazing Boba Fett costume. He then pulled up his sleeve to show a Boba Fett tattoo. They took a picture together and the gentleman asked me to email it to him. My son had the biggest smile on all day long. He felt like a celebrity! We had people of all ages comment and even people who do not know who Boba Fett was. In addition, Ethan got to wear the costume to school. Ethan described every aspect of the creation to his teacher and his peers. They were all so interested in how it was made and thought it was the coolest thing they ever saw. My wife posted it on Facebook where it was shared by others. My mother and father especially wanted to share it and state how proud she is of her son for creating such a terrific memory with Ethan. I started the idea of custom making my son's Halloween costumes after my wife's mother passed away unexpectedly. My wife always enjoyed Halloween as a child as her mother went all out in making her costumes for her. She states it is such a fond memory that she will always have. I wanted to do that for Ethan and from their it evolved into a passion and special bonding experience with him. This is amazing ! Our family loves Boba Fett.